It is always fun to spend a day with the kids and I can recall few better days on the mountain than the Tuesday of half term. The lovely thing about skiing with children is that their enthusiasm and energy is infectious; furthermore this lot didn’t half ski fast! We met as usual in the morning and were heading up the mountain at 9 (I was a little late as I had to introduce our All Mountain teens to their guides, but I soon caught them up). 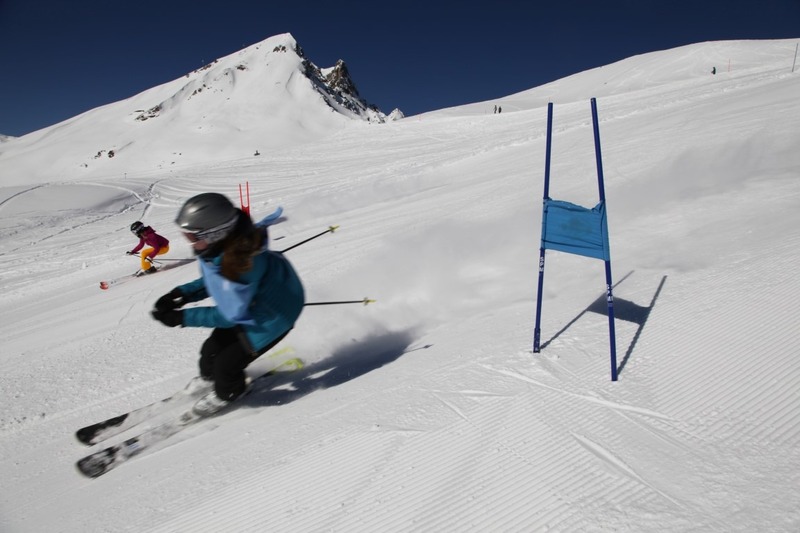 It was then straight over to the Mahder where the two lead instructors, Jorg and Andrea, had set a parallel slalom course. The plan was to divide the children into teams and have a series of head to head relay contests. For those unfamiliar with the parallel slalom format, you have 2 courses side by side which are identical. The first racers from the two competing teams are set off simultaneously and when a racer crosses the finish line, their next team mate can start. So the first team to get all their racers down the course is the winner. After the kids had had a couple of practice goes we split them into eight teams of 4 based on a combination of age and ability to make it as fair as possible; there were 34 children so 2 of the teams were of 5 requiring a little bit of creativity later on. The top tip I gave them all before they started was not to fall over as that would hand the initiative straight to the opposition who could then relax for the rest of the race. This theory was exemplified in the very first rate when the first racer on the blue course caught a tip on the third gate and crashed! It was a team event and with plenty more goes to go no harm was done. But everyone then took to heart the wisdom of my words! The racing was fun and competitive, with some incredibly close heats. One in particular springs to mind where 2 brothers were the last to go for their respective teams and it was neck and neck the whole way down like synchronised skiing, impossible to discern who was the winner from the top. For the uneven heats (where it was 4 v 5) we incorporated one of our reps into the lesser team – great delight was taken when Miles on a broken ski and no poles proved the only other faller of the day. We had a drink and snacks at the bottom of the course two thirds of the way throughproceedings which in certain quarters descended into a snowball fight and then it was back up to the top for the finals, which I hasten to add did not disappoint from a spectator point of view. After a hearty lunch at the top of the Gotschna (where co-incidentally they were showing the parallel slalom from the world championships in St Moritz) it was back on to the slopes for a more relaxed afternoon ski. The fun park (actually a ski cross course) on the Totalp is where they all wanted to head with its jumps and rollers so that was very much incorporated into the afternoon’s programme. The run down to Klosters as ever involved a few diversions into the rat runs through the trees, which again the children adore. There were lots of smiling faces at the bottom, especially when one of the PT Ski vehicles turned up to offer some of them a lift back to their hotel (not that it is a particularly long walk!). The kids had had a great day and so had I. I just wish I had volunteered myself to be one of the reps to get to ski in the slalom.